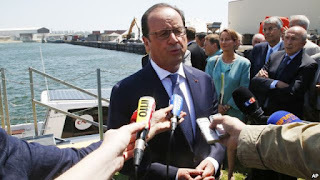 FILE - French President Francois Hollande answers reporters as he arrives at the "Companie Nationale du Rhone", France's second largest electricity producer, in Lyon, central France, July 1, 2015. Many local governments in France are not waiting for a U.N. climate conference in December to set plans to fight heat-trapping greenhouse gases. Paris, which is getting special attention since it is hosting the climate summit, is planning to transform itself into an eco-city in the months ahead. It's another hot day in Paris. This summer has sent temperatures soaring across Western Europe, and this city has seen its hottest July day on record. It is going to get even hotter in the coming years. Climate change will make weather shifts more extreme. “The city of Paris is changing [its] climate. So are other big cities in the world. ... We can have snowstorms. We can have floods. We can have things we are not used to, so we are getting prepared to face them," said Deputy Paris Mayor Patrick Klugman. Like a growing number of cities, the French capital has drafted a climate action plan. By 2050, it aims to cut greenhouse gas emissions by 75 percent from 2004 levels. Klugman says fighting climate change starts locally. “Cities are really the places of the problems and of the solutions. So far, we are the places of the problems - the emissions, the concentrations of all kinds of pollutions, air pollution, all kinds of destruction of the climate. And now there is a common will to make cities the safe places to be for the environment. It is an emergency we are facing," he said. Searching for solutions is turning Paris into a giant construction site. The city wants to create green neighborhoods, new modes of transportation and many more pedestrian areas. An architectural study of what the French capital could look like by 2050 shows a transformed city, with plants sprouting from every building. Some of the changes are already underway. A new tramway ringing Paris is nearly finished, and the metro is being extended. Chunks of the city are closed to traffic on weekends. There are plans to ban diesel fuel and to turn a major artery by the Seine River into a pedestrian parkway. The city’s iconic electric car- and bike-sharing schemes have taken off. Electric motorbikes are next. For Parisian Lamine Camara, bike-sharing is a way to get around the city quickly and easily, but he does not consider himself an environmentalist. "If it can help fight climate change, then why not? But I am not really interested in the subject. It is not my first concern," said Camara. Climate expert Charlotte Izard works for the environmental group Climate Action Network in an eco-friendly building just across the city limit. She thinks the Paris plan is good, but moving too slowly. Experts say cities like San Francisco and Copenhagen are way ahead. “We are waiting for action now. We do not have time to wait. They have to make it now. Do not wait for another mayor. They have to do it now because climate cannot wait ... and citizens cannot wait, too [either]," said Izard. Many drivers think Paris is moving too fast. Car lanes are evaporating and a group called “40 Million Motorists” is fighting the city to keep them open. Driver Fernando Figuera, who delivers metal closets, says getting around Paris is not easy. "I have to be organized and start early in the morning to avoid heavy traffic and find parking places," he said. "Reducing the number of vehicles in the city is a good idea, but compromises need to be made so it does not hurt business." So the rhetoric, like the temperature, is heating up here. But polls shows many Parisians support the city’s climate plan, agreeing the time for action is now.